According to the saying “low and slow is the way to go”, so here’s a beef brisket recipe that does exactly that. With smoking time at approximately 18 to 20 hours, this is definitely worth every minute that you will be impatiently waiting for that delicious brisket! The brisket that is being used in the video is an untrimmed packer brisket, but you can follow the rest of this guide even if you trim your brisket. Put the brisket in a disposable roasting pan. Inject the meat with the beef broth mixed with some of your spice powder. Make injections every two inches to create a grid pattern, and inject at a 45 degree angle about halfway through the meat. When you have injected the brisket all over, liberally apply the spicy rub. Cover the pan with foil and put the brisket in the fridge for at least 1 hour. Fire the grill up. The temperature should be between 200 to 250 degrees (staying closer to 200 deg.) and put the brisket on. After approximately 6 to 8 hours take the brisket out. Put it back in the roasting pan and add about two inches of beef broth. You can also add more of the rub at this point. Cover with foil and put it back on the smoker with the meat probe in there. Smoke until internal temperature reaches 195-200F. When the brisket hits the 200F mark, pull it off the smoker. This is where you will need the cooler and the towel. Get the brisket out of the pan and wrap it in some foil. Be careful when handling the meat, as both the meat and the liquid are very warm- use heat resistant silicone gloves. Put the wrapped brisket in the cooler and cover it with the towel, and let it rest and tenderize for about 2 hours. To separate the fat from the juice you have in the pan, put it in a container (such as a cooking pot) and leave it in the fridge until the fat forms a cap at the surface. You can then easily remove the fat and use the rest for some extra flavor on your brisket. Cut the brisket across the grain, and enjoy! 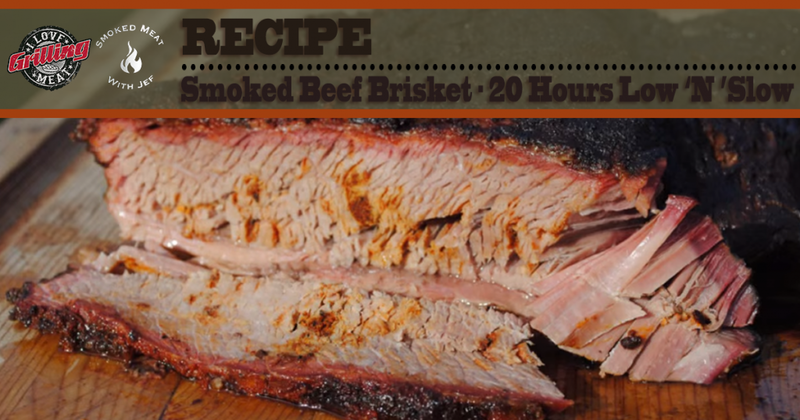 Smoked Beef Brisket Recipe (Burnt Ends Included) A step-by-step method for the perfect smoked beef brisket, strictly Texas style. While many people prefer to trim the point off the brisket, in this guide we will be doing a medium trim-down.